Commodore’s Corner by Ken McKenzie. Here it is March, it’s sunny and beautiful outside. I hope everyone is on their boat and getting it ready or as I wish I were…out sailing! The issues with my insurance company notwithstanding I intend to try and get my boat ready for summer. Hopefully with some good luck (which I could use) I’ll be able to get some sailing in. Here’s to fair winds the rest of this year. Hope to see everyone this coming Tuesday at the dinner meeting. 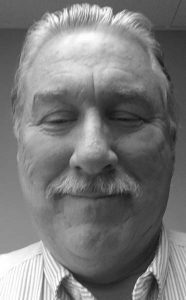 Dinner Meeting: Tuesday March 20, 2018 by Roger Newby. Please plan to attend the March 20th Club Dinner Meeting, where our presentation will be made by two experienced “expedition specialists” from Expedition Trips (www.expeditiontrips.com.) Chris Myers and Jessica Apfel have led many amazing expedition-style trips, with Antarctica a frequent destination. 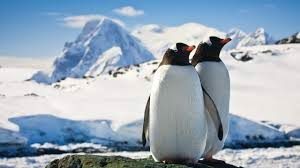 Their presentation will be about Antarctica. Chris tells me he sees quite a number of interesting parallels between the days of square-rigged sailing vessels risking lives to discover what things are like at the southern Pole and those who undertake today’s expedition-style adventure travel to that environment. They have lots of interesting stories to tell, photos to share, and will be available for any and all questions. We made a small change in the dinner meeting schedule last month and it worked well, so we plan to continue having everyone be seated by 6:45. At that point, the Commodore will conduct our short club meeting (intro of past Commodores, update on upcoming events, etc.) and then we’ll have dinner. This approach allows us to finish the formal dinner meeting a bit earlier (8:30 is the target) so more members on tight schedules can still attend and enjoy the whole meeting. Main course selections are due by 9:00pm on Friday March 16. Cancellations must be made by 9:00pm the same day. Cruisers had good weather and smooth sailing for their trip to Bell Harbor, our first official cruise of the season. Nine boats made the trip, and 27 of us had a feast at Anthony’s on Saturday evening. The pre-dinner happy hour required two boats to hold all the merry makers, a few of whom appear in the photo. Dennis and Kathy of “KaDence” forgot to fly their burgee when sailing into Bell Harbor. 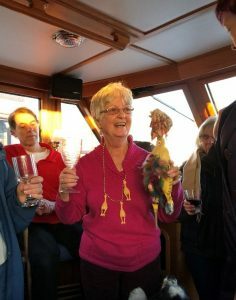 In the photo, Kathy wears her new necklace and promises to get rid of that ugly bird, the Rubber Chicken, as soon as she catches another SBYC arriving at an event minus the burgee. 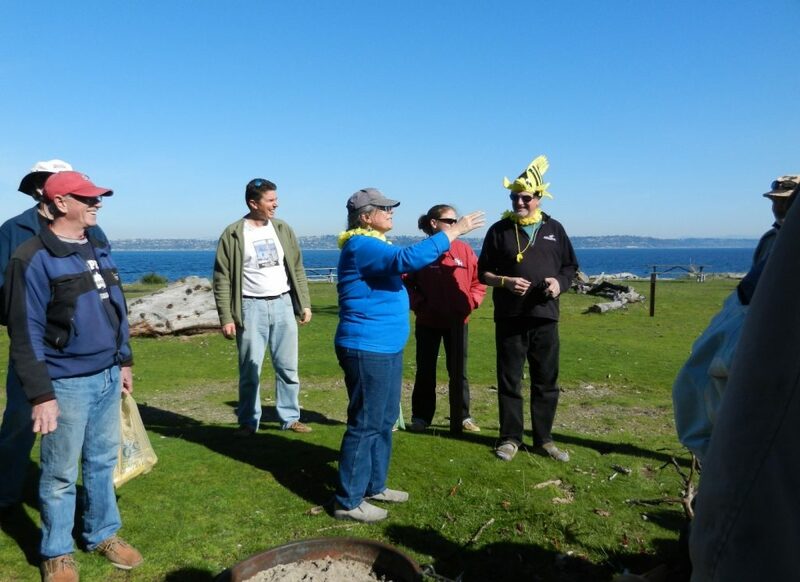 Our next fun cruise is to Blake Island, where we enjoy the park in its early spring state, (bring boots for walking in the mud on the trails), and we enjoy the best Easter egg hunt ever, directed by Sam and Dave Krause, on the sailboat State of Mind. Cruisers should plan to come to the island as early as they can. Slow Dance will try to get there Friday morning. Some cruisers arrive Thursday. Sam has provided minimal instructions, which follow. “Bottle hunt” refers to the small liquor bottles you get on airplanes. Sam and Dave hide them, and, then we cruisers run around like lost rabbits trying to find them. I seem to remember Dave hid over 100 last year, and they were all found. Bottle Hunt is at 3:00pm Saturday, March 31. Bottles need to be delivered to State of Mind by 2:00pm so there is time to hide them. Bottles may be decorated. If people don’t have yellow decorations for the bottles, we will have ribbon, pipe cleaners, and yarn available, but the donors need to do the tying of the bows. Sam will cover this more, as boats arrive, and is always ready to answer any questions. Some boats come with yellow decorations. The potluck is free-form. We swap bottles in the pavilion, do the last-minute prep on dinners, then reconvene at the Pavilion for cocktails, snacks, and dinner. We can have a sing-a-long until 9:55pm. Bring an instrument if you play one. Bring wood, if possible. There is a fire in the evening at the potluck. If we have enough wood, there will be a morning fire or a breakfast gathering on the dock. Who knows – Sunday will be April Fool’s Day!! The big points are: come early, bring wood, and do not forget the liquor bottles, at least four! SBYC June Dinner Dance, June 9, 2018 at Brownsville Yacht Club. June dinner dance planning meetings are beginning. One will be held at Yellow Fest, at Blake Island, and more to follow. If you are interested in helping with the planning, we would love to have you, it is almost as fun as the dance. I will keep in touch. As I write this, it feels like spring might finally be getting closer. There are fewer days of steady rain, and more sun with longer daylight hours. Saturday, March 17 is the last of the Snowbird Series races for this year. There is still time to send in your registration and use this last race as a tune up for the summer. At only $15 it is a great bargain. Snowbird Race of 2015. This weekend promises to be a lot warmer! About an hour after the race we meet at Ray’s Boat House (upstairs in the bar) for results, announcements and handing out of the SBYC award plaques. Although there are no prizes for the series, you will have a chance to find out how you did that day and spend a few minutes talking with other skippers and crew. 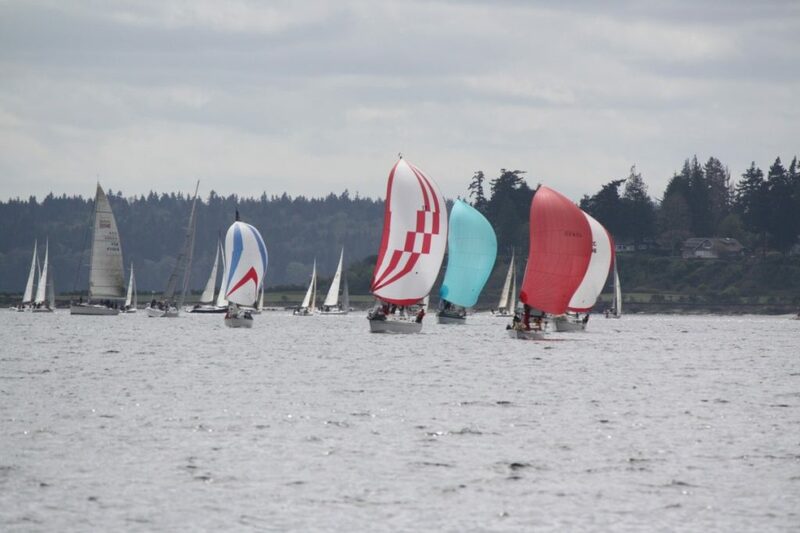 Come out and join us, the weather forecast is looking good, and given the relatively short race, it is a great chance to have a tune up before the upcoming Blakely Rock race, or all the spring races sponsored by all the yacht clubs around the area! Ken Chin in Kowloon leading this group of boats after they have rounded Blakely Rock and headed back to Shilshole. Ken has the white spinnaker with the broken vertical stripes. Tour and Tasting by Nancy Kick. 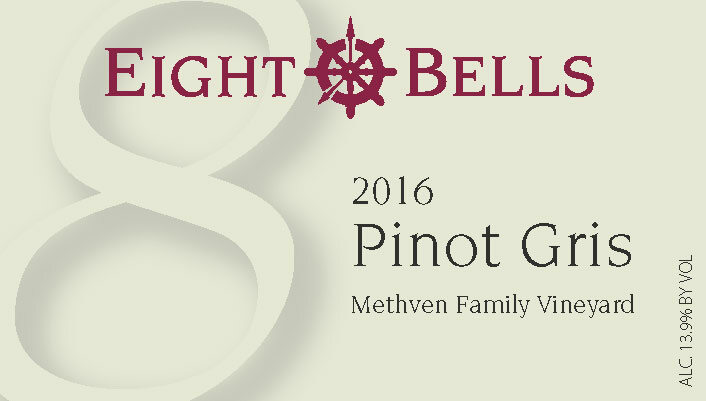 Please join us for a free, private tour and tasting at Eight Bells Winery* the afternoon/evening of Saturday, April 14, 2018. We will plan a dinner to follow if people are interested (note: the dinner will not be free). The winery is located in the Ravenna neighborhood of Seattle near 65th and Roosevelt. Some of you will know them as the wine we bring to parties with the glass corks. Website Updates by AJ Mallory. I wanted to update all of you on some changes that have been made to the website recently. I don’t know about you but I found our existing domain name shilshole-bayyc.org to be very difficult to remember. Is it shilsholebay-yc.org or shil-shole… “I know there’s a hyphen in there someplace”… After thinking about this and discussing it with the board I proposed to make a change. I wanted to make our website easier to remember. Unfortunately my first choice sbyc.org was taken so after much looking I came up with a longer domain name shilsholebayyachtclub.org. 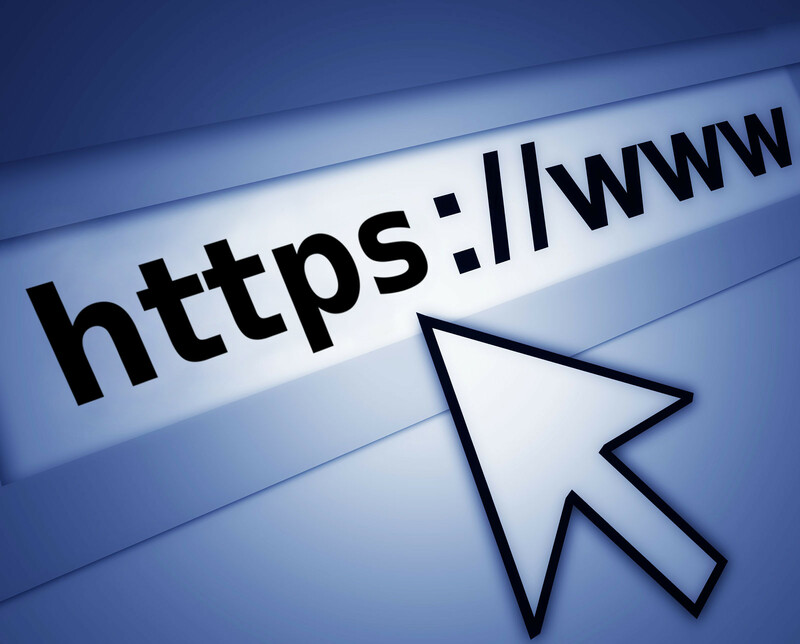 The observant will notice one other subtle difference in the URLs above – https: vs. http: Https is the secure version of the HyperText Transfer Protocol. This secure protocol means that information sent from the web server to a web browser is encrypted. This is one step that has to be taken that will allow us to conduct credit card transactions through the website. Another thing to note is the email addresses for board positions have changed to the new domain. 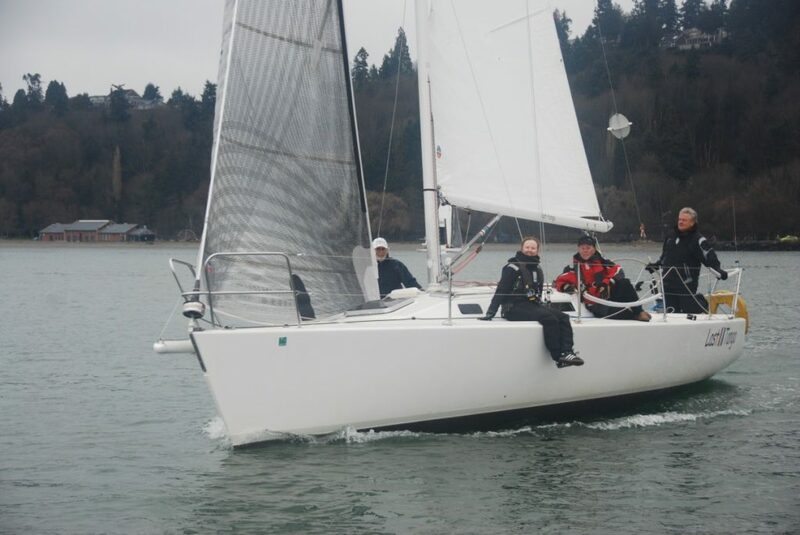 So commodore@shilshole-bayyc.org is now forwarding to commodore@shilsholebayyachtclub.org. Please use the new email addresses. Finally, for a couple of reasons we moved hosting companies. Our old host GoDaddy.com was expensive and had some policies that were going to cost us more money to solve some problems. They required a non free SSL certificate (that’s the technical thing that allows us to serve secure content from the website.) They would charge extra to keep my contact info private. And on top of all that they were more expensive. We are now hosted at SiteGround.com at a lower cost, with more features and larger email inboxes for board members. If you see or know of anyone who has links to our website please let them know to update them. If you have saved favorites to our website you should update them as well. Questions? 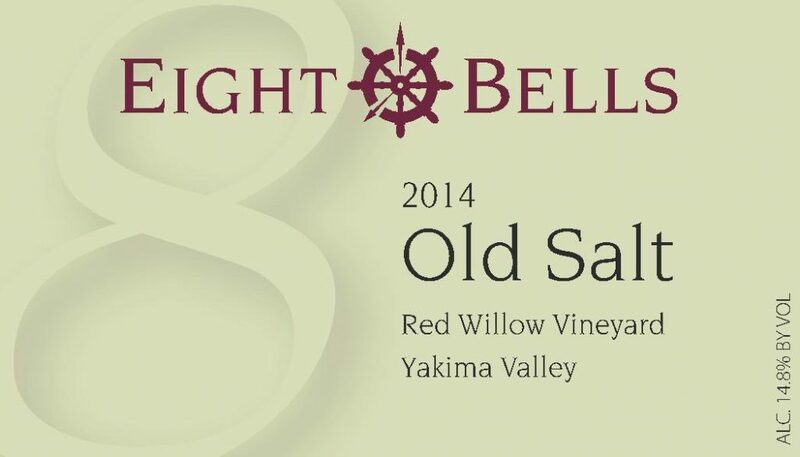 email: webmaster@shilsholebayyachtclub.org or catch me at any of the dinners or cruises this season. Live-aboard Trends by Roger Newby. Live-aboard Trends, from the Perspective of a Yacht Broker. Another distinguishing characteristic are those eager to buy a live-aboard boat, cut their ties to land life, and join the small minority of boaters who live full-time aboard their boats. I was a live-aboard for 10 years, in the 1990’s. It was a great experience, one that I’m glad that I undertook and which I can now use to relate to those we encounter who are eager to take on this lifestyle. And it is a lifestyle, to be sure. I was recently divorced when I took the plunge and 36 years old. I ended up with the house and while that was a good financial result, I wasn’t too thrilled with continuing to inhabit that place by myself. A good friend suggested “you love boats so much, why don’t you just sell the house and live on a boat?” That suggestion, when my friend made it, created a dual feeling of excitement and big anxiety. Yes, I was excited to think about doing it – very excited in fact. But, I had huge doubts – would I be happy in such a small space? What would I do with all my stuff? Would I come to regret this impulsive-sounding, non-normal choice? The typical live-aboard wannabe that we see coming in our door is a younger couple or a young single male. Let’s define “young” here, a relative term as most of us know. In this case, I’m saying “young” means under 40. These are people who have built enough of a career, in most cases, to have the financial means to elect to enjoy a period of living on the water, not worrying about whether it may or may not be the best financial planning decision of their lives. But, in most cases, they are pretty darn committed to the idea and very excited about it. Marinas have been feeling the pressure. Additional monthly fees to live aboard have been regularly increasing. Pressure to stay within the guideline of no more than 10% of a marina’s slips being “live-aboard” are also quite evident. A wait list for “live-aboard” status is a growing list. In our case, an amazing example of this trend is a couple in Everett who have now bought four boats from us – a 38′ trawler for this late-50’s couple to live on themselves, another trawler for their daughter and her friend to live aboard, and two sailboats for the two sons. I call it “the family plan” group. They have had some boat experience, but not a lot. And while the economic argument was an initial motivator, life on the water has become something the whole family is now enjoying greatly, in other words, no regrets. And they haven’t even had the chance to do a family summer rendezvous at a local anchorage yet! Our world is changing all around us. As real estate prices go through the roof, more people are figuring out that living on the water can be not only exciting, but economical. It isn’t the way I had thought we would encourage more people to get into boating, but what the heck! Quartermaster Report by Nancy Merson. I have put up a new 3’X5′ flag on the flagpole at Shilshole, after repairing the old one a number of times to help it to last more than two years. The cost for these large burgee flags has gone up to $112.00 each. If you notice it fraying badly, snagged on lines, or anything else that might limit the life of the flag, please send an email to: quartermaster @ shilsholebayyachtclub.org. I still have three fleece caps with our burgee for $25.00 each, and decals for your boat, or car, of our burgee for $3.50 each. If interested in purchasing any of these items, notify me at the quartermaster address. We are still working on getting an account with “zazzle” that will belong to our club and not to anyone else!